Check out Tobi's Daryn Collared Shift Dress Double layer dresses get the zipper treatment with the Black Daryn Collared Shift Dress. This directional shirt dress has a classic shirt collar with a zipper fastening and mesh at the waist for an unexpected touch. Pair this shift dress with booties for an easy put together look this fall. 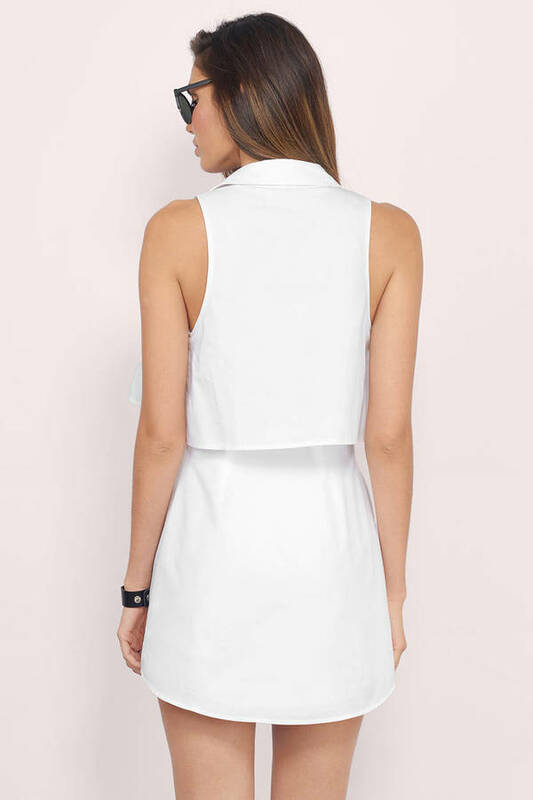 Double layer dresses get the zipper treatment with the White Daryn Collared Shift Dress. This directional shirt dress has a classic shirt collar with a zipper fastening and mesh at the waist for an unexpected touch. Pair this shift dress with booties for an easy put together look this fall. Double layer dresses get the zipper treatment with the Black Daryn Collared Shift Dress. This directional shirt dress has a classic shirt collar with a zipper fastening and mesh at the waist for an unexpected touch. Pair this shift dress with booties for an easy put together look this fall. Model's profile: height 5' 7", bust 32", waist 24", hips 34"
Model's profile: height 5' 10", bust 34", waist 25", hips 34"